200-300 CE: The “Seven Laws of Noah” were discussed in the Babylonian Talmud. 4 BCE- 2 CE: Gentiles known as “God-sympathizers” (sebomenoi) observed Jewish practices but did not convert to Judaism. 1860s: The idea of Noahidism as a Judaic religion for non-Jews was developed by Rabbi Elijah Benamozegh. 1920-1930s: Aime Palliere became a Noahide and spread the teachings of Elijah Benamozegh in Europe. 1980s: The Lubavitcher Rebbe, Menachem Mendel Schneerson, promoted the Seven Noahide Laws as a universal moral code for all mankind. 1990: The first international Noahide conference was held in Fort Worth, Texas. 1991: The United States Congress recognized the Noahide Laws as a universal moral code. 2000: Noahidism in the Philippines began to spread. 2010: The Netiv Center for Torah Study, a Noahide congregation, opened in Texas. 2012: The Temple Institute held its Twenty-Fifth Anniversary Celebration with Noahides in Dallas, Texas. 2015: The “Brit Olam: World Noahide Center” was founded online. 2016: The “Noahide Academy” opened online offering courses and certificates for Noahides. 2017: Second Annual Worldwide Noahide Convention took place in Jerusalem. The term “Noahide” refers specifically to a non-Jew who observes the “Seven Noahide Laws,” believes in the truth of Judaism, but does not convert to Judaism. The Seven Noahides Laws refer to the seven commandments that God gave to the children of Noah after the flood, as derived from passages in the Torah. Some of the earliest references to the “Seven Laws of Noah” can be found in the Babylonian Talmud (tractate Sanhedrin, folios 56a-60a), where they appear as part of a theoretical rabbinic conversation regarding the status of non-Jews in the land of Israel. According to the rabbinic consensus in the Talmud, these seven laws constitute God’s original pre-Judaic covenant with man and remain incumbent upon all of humanity. While a specifically Noahide communal identity and faith would not emerge until modern times, there is some evidence of ancient proto-Noahide communities in the Eastern Mediterranean around the fourth century BCE. Jewish and Christian sources describe the presence of quasi Jewish communities, which adopted Jewish practices but not did not convert to to Judaism, known collectively as “fearers of the Lord” (sebomenoi) (Luria 1994:20; Novak 1983). The Mishneh Torah, written by Moshe Ben Maimon (Maimonides, 1135-1204) provides another authoritative theological discussion of Bnei Noah from the Middle Ages. According to Maimonides, just as Jews are required to follow Mosaic Law and observe all 613 commandments given in the Torah, non-Jews are obligated to observe the original Seven Laws of Noah. A non-Jew who keeps these laws will be considered a “righteous gentile” and will have a place in the “world to come.” According to Maimonides, messianic times will bring the spread of global monotheism as gentiles recognize the authority of the seven laws and accept the oneness of God. The idea of Noahidism as a religion, rather than a purely theoretical discussion in Jewish law regarding the legal status of non-Jews, was elaborated by Elijah Benamozegh (1822-1900). Benamozegh was an Italian Rabbi and kabbalist who promoted the Noahide laws as the universal religion of the future, that would unite humanity under a singular monotheistic moral code. Benamozegh’s writings were edited and disseminated by his student, Aime Palliere (1875–1949), a French theologian and Zionist, who, like many Bnei Noah today, followed a trajectory from Catholicism to Evangelical Christianity and eventually Judaism. Under the spiritual direction of Benamozegh, Palliere was discouraged from conversion to Judaism, and instead took on the status of a Noahide. He dedicated his life to the study of Torah, spreading the Noahide message, and working as a leader within the Zionist movement in France. Palliere viewed Zionism as part of the destiny of the Jewish people, who by returning to the holy land and taking on their role as the “chosen people,” would help gentiles to realize their own destiny in becoming Noahides. Rabbis from the Chabad Hasidic movement have continued to spread the seven Noahide laws amongst non-Jewish communities. Chabad rabbis are typically sent as emissaries around the world to build Jewish communities and bring more secular Jews into observant life. However, since the early 2000s, they have increasingly devoted resources to building Noahide communities abroad, particularly in the global south, identifying potential Noahide leaders on the ground and training them through internet seminars. The spread of Noahidism as new Judaic lifestyle and belief system for non-Jews is directly linked to the connective power of the internet in the twenty-first century. Noahides utilize twenty-first century technologies, such as Facebook and Skype, to study Torah with Jewish rabbis and communicate with growing Noahide communities around the world. One of the largest Noahide communities to emerge as a result of Chabad emissaries and online learning opportunities is in the Philippines, where there are currently an estimated 2,500 practicing Noahides and nine Noahide synagogues on different islands. According to Rabbi Michael Shulman, who runs asknoah.org, a Chabad affiliated website that provides Noahides with Torah learning materials, Noahides have grown to tens of thousands and there are communities around the world, most notably in Great Britain, the Philippines, Latin America, Nigeria, Russia, and the United States. 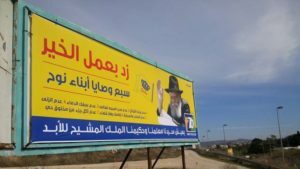 During a recent wave of violence in Israel/Palestine (September 2015-January 2016), ignited by tensions on the Temple Mount, Chabad rabbis began displaying billboards [Image at right] in Arab villages and handing out flyers proclaiming the universality and importance of the Noahide laws (Rosenbert 2015). In the United States, the spread of Noahidism dates back to the 1980s (following a proliferation of millenarian movements in the 1970s) and began with the conversion of individual evangelical ministers coming out of the Hebrew Roots movement (Kaplan 1997). As they became more interested in Jewish traditions, inconsistencies between the Old and New Testaments led these ministers to seek out Torah study with Orthodox Jewish Rabbis, who eventually guided them to the Noahide laws, and the Jewish vision of in the messianic era. These ex-evangelical ministers then went on to establish the first Bnei Noah communities and synagogues, often bringing their former congregations along with them. Many American Noahides credit the work and writings of Vendyl Jones (1930-2010), a former evangelical pastor and biblical archeologist, who famously went looking for the ark of the covenant, with building the foundations of the Noahide movement in the American Southwest. Today, the Noahide movement continues to grow across the American Southwest and in other urban centers across the country. Some active congregations include the Netiv Center For Torah Study (Texas) and The South Plains Hebraic Center (Texas), The Noahide Torah Study Group (Kansas City), Noahide Study Group of Jacksonville Beaches (Florida), The Lansing Chavurah (Michigan), and the Noahide Community of Tampa Bay (Florida). While Chabad Rabbis have avoided officially affiliating with the previously evangelical Noahide communities in the United States (focusing instead on Europe and the third world), other rabbis from Israel’s right-wing religious Zionist demographic have established strong connections with them. Most notably, Rabbi Meir Kahane (1932-1950), an American born Israeli Rabbi and politician, who promoted a militant form of messianic Zionism, advocating for the expulsion of Arabs from Israel and the Palestinian territories. Kahane formed alliances with early Noahide leaders such as Vendyl Jones and delivered the keynote speech at the first international Noahide conference held in Fort Worth Texas in 1990. In his speech, Kahane connected the emerging Bnei Noah movement to the unfolding of Jewish prophecy in Israel (the return of Jews to the land the creation of the Jewish State) and to the final redemption of all mankind. Following Kahane’s death, The Temple Institute, led by Rabbi Yisrael Ariel (who was also a member of Kahane’s former political party), became the leading Jewish organization to work with Noahides in the American Southwest. The Temple Institute is part of the larger Third Temple Movement in Israel, a theocratic movement that wishes to rebuild the Third Jewish Temple on the Temple Mount in Jerusalem, reinstate a priesthood and sacrifices, and transform Israel into a theocratic Torah state (Inbari 2009; Gorenberg 2002). In recent years, the Third Temple Movement has moved from the margins into the religious-nationalist mainstream, gaining access to state funding, national service volunteers, and political endorsement from members of the ruling Likud party (Feldman 2017; Persico 2017). In addition to the Temple Institute, there are a growing number of rabbis from Israel’s religious nationalist demographic who are working with Noahide converts around the world. A popular internet portal called “Brit Olam: Noahide World Center” is run by religious-nationalist Rabbi Oury Cherki. Rabbi Cherki was born in Algeria in 1959 and grew up in France. He moved to Israel in 1972 and studied with Rabbi Tzvi Yehuda Kook at the Merkaz Harav Yeshiva, the foundational institute of religious Zionism that has trained many of the prominent rabbis of the religious settlement movement. These religious nationalist rabbis, who are often affiliated with the Third Temple Movement, mentor Noahides because they believe that the messianic era begins with the establishment of a Jewish theocratic state in Israel, supported by communities of Noahides, preaching Judaism’s supremacy as the one true faith around the globe. The core of Noahide belief revolves around adherence to the Seven Noahide Laws as God’s original covenant with all mankind (prior to the Abrahamic covenant and the subsequent Mosaic covenant with the Jewish people). Following the Noahide laws includes a complete rejection of former Christian beliefs, specifically belief in the divinity of Jesus, which constitutes idolatry and is forbidden according to the Jewish interpretation of the first law “Do not deny God.” Noahides receive mentorship almost exclusively from Orthodox rabbis and therefore believe in Orthodox Judaism as the only true expression of Judaism (discounting Reform, Conservative, and other varieties). They believe strongly in the Jewish people as God’s chosen nation, who are meant to guide the world towards a more perfect monotheism. Noahide communities around the world are also notably messianic. They believe in a literal interpretation of Jewish prophetic scripture regarding the return of Jewish exiles to the Land of Israel, the building of the Third Temple, and the reestablishment of a Jewish kingdom as a prerequisite to messianic times. Many of these messianic beliefs are not entirely new for Noahides, but rather a continuation of their previous Evangelical doctrines. Although Noahides adopt Jewish beliefs and rituals, most Noahides do not convert to Judaism because they make a distinction between Judaism and Jewishness. Noahides often view Jewishness a racialized ethno-national category primarily reserved for those who are “Jews by blood.” Noahides, however, believe that that they can participate in Judaism as a universal truth for all mankind by building a new Noahide religion centered around the Seven Laws of Noah. The small percentage of Noahides who do eventually convert to Judaism primarily come from middle-upper class backgrounds (approximately two-three percent in most communities). Because Noahides only recognize Orthodox Judaism as authentic Judaism, they must seek out Orthodox conversions that often require expensive seminary studies and and full time living in an observant Jewish community for at least a year. Because Orthodox Jewish conversions are lengthy and costly, only Noahides with financial means are able to relocate to Jewish communities and convert. There are also Noahide leaders who actively discourage conversion even amongst the economically privileged. Some Noahide preachers argue that Noahides have their own divinely sanctioned role in the world alongside the Jewish people, and that their goal is not to become Jews but to develop their own unique rituals and expressions of monotheism under the mentorship and guidance of Orthodox Jewish rabbis. Around the world, tens of thousands Noahides are adopting Jewish rituals, studying Torah online, and establishing synagogues under the supervision of Orthodox rabbis. There is an ongoing and contentious debate amongst Noahides and Jewish rabbis concerning the degree to which Noahides should have access to Jewish ritual life. In many communities it is common to see Noahide men wearing yarmulkes and prayer shawls, married Noahide women covering their hair, Noahides observing the Sabbath and major Jewish holidays, and buying kosher food. However, the degree to which a particular Noahide community adopts Jewish traditions largely depends on the theological interpretations of their particular rabbinic mentors. While some rabbis openly encourage Noahides to adopt Jewish ritual life, others, particularly from the Chabad orientation, discourage it and argue that Noahides should maintain clear distinctions between themselves and Jews. To this end, Chabad published a Noahide prayer book (2016) with new unique prayers and rituals written specifically for Noahide communities. For example, instead of keeping the Sabbath, a commandment restricted to Jews, the Chabad prayer book includes a new ritual for a Noahide “Seventh Day” celebration instead. In contrast to Chabad emissaries, who promote the observance of Jewish customs in a very limited way, some Israeli rabbis from the religious-nationalist sector encourage Noahides to take on more Jewish commandments, manner of dress, and holiday traditions. Today, there are at least ten different organizations, with physical and online locations, run by Jewish rabbis who are working to mentor Noahides. While each organization has a slightly different leadership style, some general patterns can be discerned, particularly in the third world where Noahides rely almost exclusively on the internet for contact with the Orthodox Jewish establishment. Websites run by Orthodox Jewish rabbis cater to Noahides, offering online Torah study and certificate programs, where aspiring Noahides can study the seven laws and receive Jewish mentorship (for monthly or yearly fees). While giving these courses, Jewish rabbis search for potential leaders, Noahide students who can bring the teachings they learn online back to their local communities. When leaders are identified, they often become middle men in the process of proselytizing and spreading the Noahide faith. These middle men report to Jewish rabbis and filter down the teachings they learn online into their own native language to local community members who may not have the means to enroll in courses online. In many cases, these local communities in the third world are former congregations of evangelical Christians who are converting to become Noahides following the instruction of a pastor leader/middle man who reports to Jewish rabbis abroad. While the idea of non-Jews studying Torah and following the Noahide laws is not inherently controversial, the political challenge of Noahidism arises when we examine the connection of Noahides to the Third Temple Movement and growing theocratic forces in Israel. As the Third Temple Movement grows in Israel and abroad and inspires a vision of a Jewish theocratic state, it draws into question the relationship between Jews and non-Jews in messianic times. The Noahide movement responds to this question by carving out a place for non-Jews in the messianic Zionist project, providing them with a new spiritual identity and new forms of ritual life based on Jewish customs. This raises the question: Has messianic Zionism created a new world religion? In the past, Evangelical Christians have been important and powerful allies for Jewish Zionists. It is possible that what we are seeing today is the establishment of a more “kosher” alliance, non-Jewish Noahides are giving up their belief in Jesus and supporting the Zionist project through their new Judaic faith. The second challenge is a theological/categorical one. Most rabbis working with Noahides deny that Noahidism is a new religion, arguing that Noahidism is an ancient and natural “category.” Noahidism is the natural religion of all mankind, because all mankind descends from the sons of Noah and is therefore included in the Noahide covenant with God. The idea of “Jews” and “Noahides” as natural categories of humanity can appear as a form of theological Jewish supremacy, reinforcing the idea of Jews as a chosen people carrying out divine will with the help of Noahide supporters who recognize their superior position. As mentioned earlier, a racialized idea of Jewishness remains a strong current in the Noahide world. The rapid growth of the Noahide movement in the 2000s, especially in the third world, also draws into question the financial accessibility of Orthodox Jewish conversion in the twenty-first century. Through the proliferation of internet technology, remote communities around the world are being introduced to Jewish learning and rituals for the first time online. However, many of these communities lack the resources to pursue Orthodox Jewish conversion and are often encouraged to remain as Noahides by rabbi mentors online. Because of this arrangement, some Jewish organizations may be in a position to gain financially from geographically isolated communities, who are eager to form relationships with Jewish clergy and receive Torah knowledge online. A final issue involves the global and amorphous nature of the Noahidism, which has yet to be codified into a specific set of religious practices. While all communities and rabbinic mentors agree on the Seven Laws of Noahide as the foundational doctrine, each community has taken on its own character and ritual practices according to the theological and political orientations of their rabbinic mentors, goals and desires of local Noahide preacher/leaders, and previous religious communal structures/styles of worship. Furthermore, thousands of Noahides worldwide do not belong to any physical community but participate in Noahidism virtually through online seminars and meetings. Thus, it remains to be seen whether the different rabbinic factions and local Noahide congregations will join together into a unified global religion with clear ritual and doctrinal standards. Feldman, Rachel. 2017. “Putting Messianic Femininity into Zionist Political Action: The Case of Women for the Temple.” The Journal of Middle Eastern Woman’s Studies. Forthcoming, November13:3. Gorenberg, Gershom. 2000. The End of Days: Fundamentalism and the Struggle for the T\emple Mount. Oxford: Oxford University Press. Inbari, Motti .2009. Jewish Fundamentalism and the Temple Mount. Albany: State University of New York Press. Luria, Maxwell. 1995. Elijah Benamozegh: Israel and Humanity. New York: Paulist Press. Novak, David. 2011. The Image of the Non-Jew in Judaism. Oxford: The Littman Library of Jewish Civilization. Persico, Tomer. 2017. “The End Point of Zionism: Ethnocentrism and the Temple Mount.” Israel Studies Review 32:88-103. Rosenberg, Shmarya. 2015. “Chabad Launches Special Mitzvah Campaign For Palestinians Promoting 7 Laws Of Noah, Dead Rebbe As Messiah.” FailedMessiah.com, December 04. Accessed from http://failedmessiah.typepad.com/failed_messiahcom/2015/12/chabad-launches-special-mitzvah-campaign-for-palestinians-promoting-7-laws-of-noah-dead-rebbe-as-mes-678.html on 8 October 2017. U.S. Congress website. 1991. “To designate March 26, 1991, as `Education Day, U.S.A.” Accessed from https://www.congress.gov/bill/102nd-congress/house-joint-resolution/104/text on 8 October 2017.